All Services are officiated by Student Rabbi Deborah Goldberg from Hebrew Union College-Jewish Institute of Religion. Guests are welcome and encouraged to phone 419-625-5852 for information. We are a small congregation affiliated with Union for Reform Judaism. Donations are kindly appreciated from guests. Shabbat- August 24, 2018 at 7:30 p.m.
Erev Rosh Hashanah- September 9, 2018 at 8:00 p.m.
Rosh Hashanah- September 10, 2018 at 10:00 a.m.
Kol Nidre- September 18, 2018 at 8:00 p.m.
Shabbat- October 05, 2018 at 7:30 p.m.
Shabbat- October 26, 2018 at 7:30 p.m.
Shabbat- November 16, 2018 at 7:30 p.m.
Shabbat- November 30, 2018 at 7:30 p.m.
Shabbat- December 14, 2018 at 7:30 p.m.
Shabbat- January 25, 2019 at 7:30 p.m.
Shabbat- February 15, 2019 at 7:30 p.m.
Shabbat- March 1, 2019 at 7:30 p.m.
Shabbat- March 29, 2019 at 7:30 p.m.
Shabbat- May 10, 2019 at 7:30 p.m.
Our Shabbat services are approximately 1 hour followed by social Oneg. We will resume Shabbat Services in late August 2019. Please return to the site for updates in July or early August once we confirm scheduling. 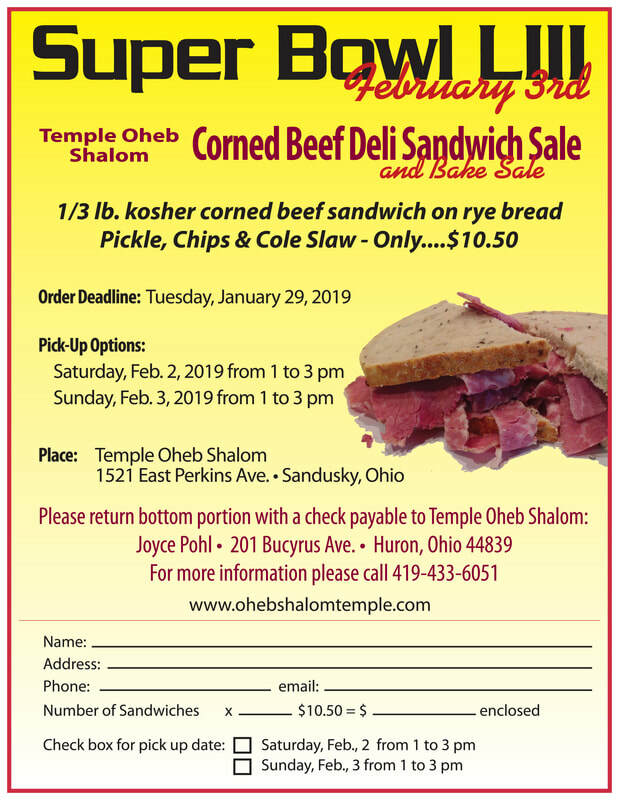 Time to order your 2019 Corned Beef Deli Sandwich for our Fundraiser! If you have never had our sandwiches- 2019 is the year for you to try them! They are delicious! Please see the flyer below for 2019 fundraiser ordering information. We have two pick up days for you to choose from! You may click on the pdf document link below this message for a printable form. Thank you for your support of our 2019 Annual Super Bowl Corned Beef Deli Sandwich Fundraiser!